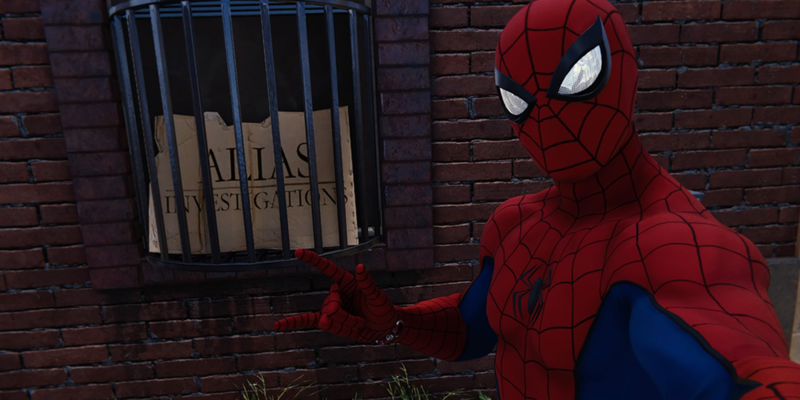 As a game that delivers not just a beautifully realised New York City but also gives us our first look at this new take on a fully established Marvel Universe, Spider-Man’s map is filled to the brim with a number of easter eggs, cameos and references. 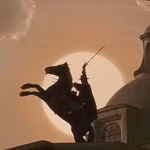 Some of the best easter eggs and references are actually famous or notable buildings from the comics and films that Spider-Man can visit (or at least swing by) in the midst of his world saving, and bad guy stopping. 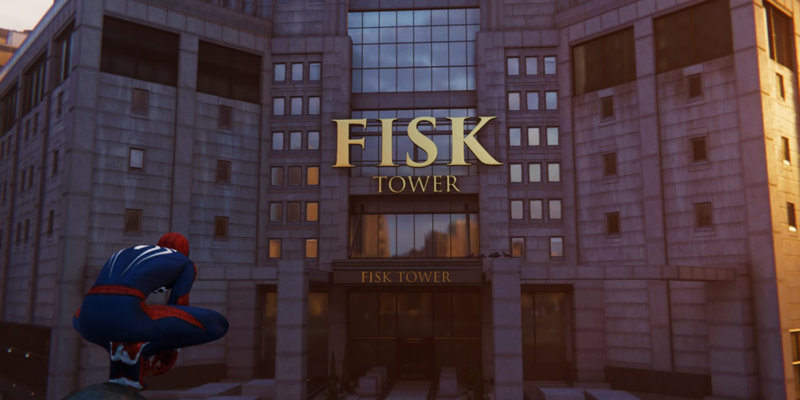 Admittedly Fisk Tower is the setting of the game’s opening sequence, with Wilson Fisk (or ‘Kingpin’) featuring prominently throughout the rest of the game. 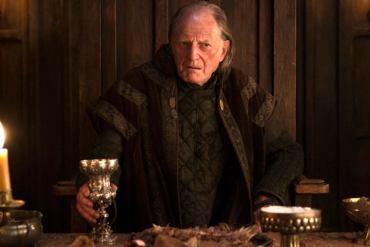 And so his business enterprises and by extension Fisk Tower are a little more than an easter egg, or reference, but they still serve as some interesting detail on where we are in this Marvel Universe and more specifically how well established Fisk’s criminal empire is. 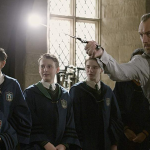 Both Harry and Norman Osborn are intrinsically linked to Spider-Man’s story, with both (at various times) being either some of Peter Parker’s closest allies, or his worst enemies. In many ways Norman is an alternate Tony Stark, using his business (Oscorp) and advanced technology to make himself a super suit and serum, eventually becoming the Green Goblin. 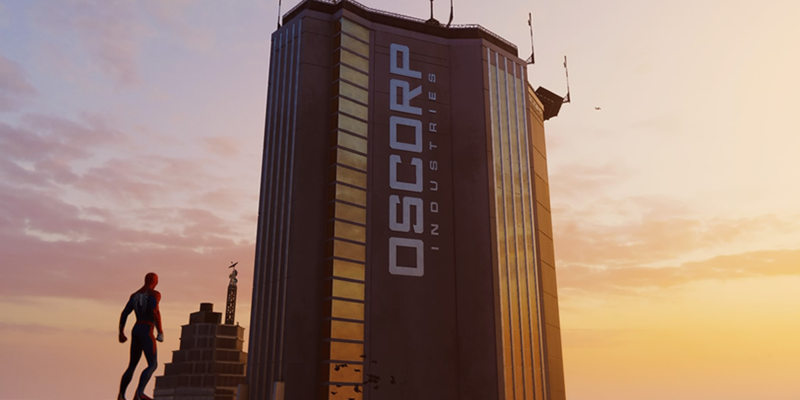 Oscorp shows up numerous times in the map of New York, with various buildings and research facilities located all over the city. The biggest of these buildings is Oscorp Tower, which is actually one of the tallest buildings on the map. 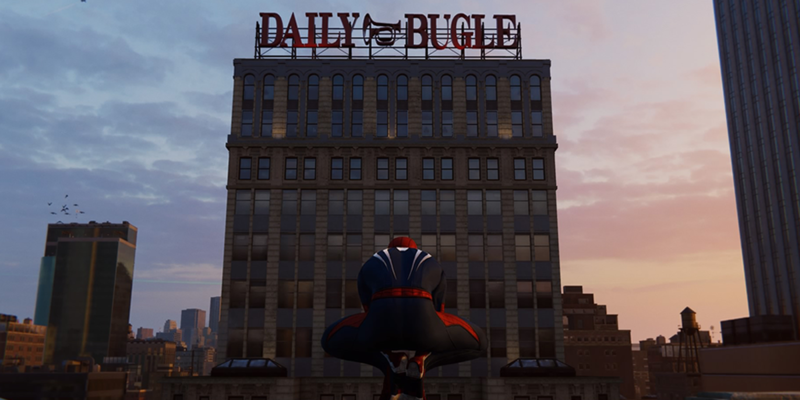 As a hallmark of Marvel’s New York, and a key part of Spider-Man’s world The Daily Bugle offices have featured in many Spider-Man games, with the latest addition to the franchise adding to that streak. 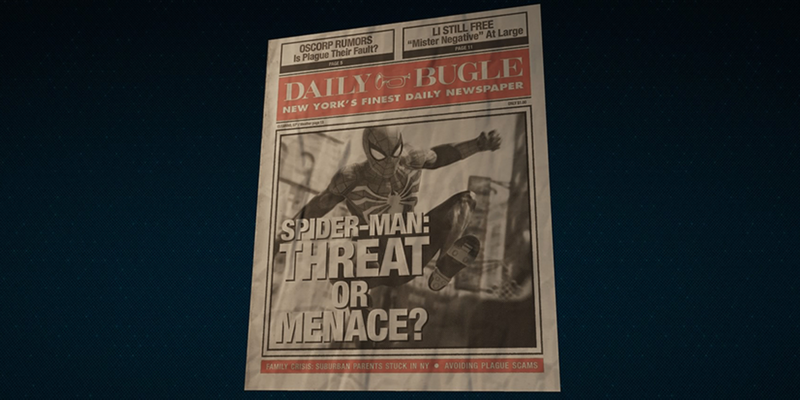 In a similar way to Fisk Tower, and Oscorp, the Daily Bugle does feature throughout Spider-Man’s storyline, being where MJ works, Bugle newspaper covers acting as one of the games many (many) collectibles, and of course J. Jonah Jameson’s new radio show is his only Spider-Man hating outlet after being fired from the Bugle. And yet despite the Bugle showing up time and again within the game, there is never a point in which you have to go to the Bugle’s offices, and so finding it comes down to one of the ‘Landmark Photo’ side missions, and makes seeing this latest version of it that much more interesting. When talking about established brands of the Marvel Universe, one of the biggest is Roxxon. Primarily an oil and petroleum company, Roxxon’s importance has varied over the years. 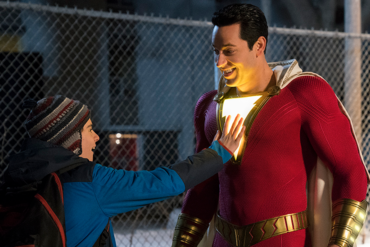 The company ranges from being a relatively unimportant and stereotypical faceless organisation in some storylines, to being crucial in others, with some showing them to be responsible for some huge events like the death of Tony Stark’s parents. 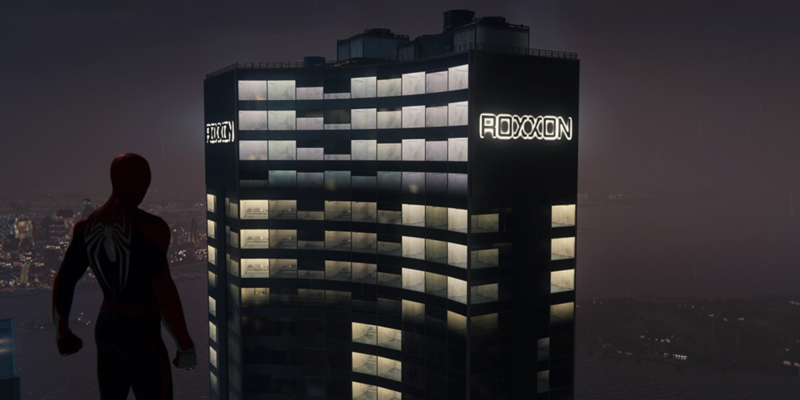 As a nod to Roxxon’s place in the Marvel Universe, one of the many skyscrapers Spidey can swing by is branded with a giant glowing ‘Roxxon’ sign, showing off their New York Head Quarters. 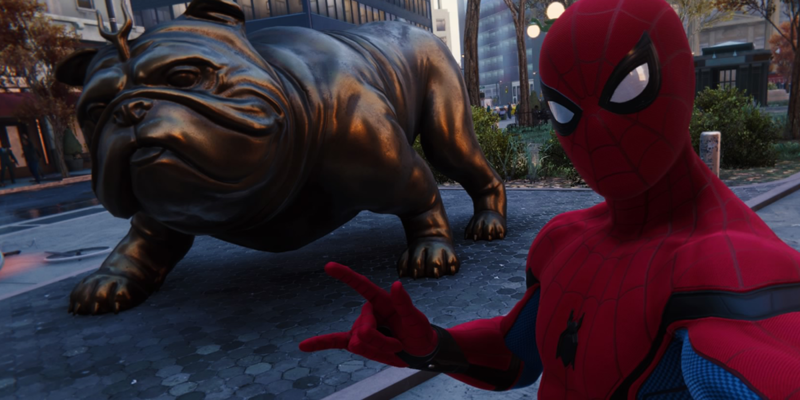 Spider-Man is far from the only superhero in Marvel’s New York, and the game has plenty of references to those other heroes, from Iron Fist, and Jessica Jones, to Daredevil. One of the bigger hints at Daredevil and his secret identity Matt Murdoch is his favourite Hells Kitchen bar, ‘Josie’s Bar’. 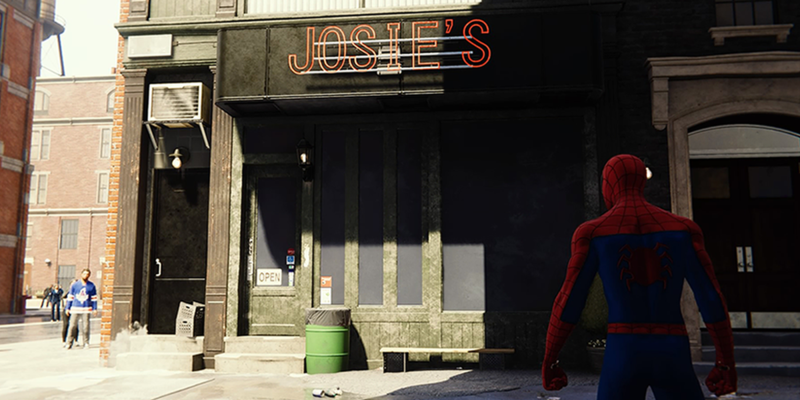 Frequently seen in the comics Josie’s bar is a hot spot for underworld and criminal activity that Daredevil keeps a firm eye on, and in Marvel’s Netflix show Matt Murdoch and his best friend and partner Foggy Nelson are regularly seen there, drinking their problems away. 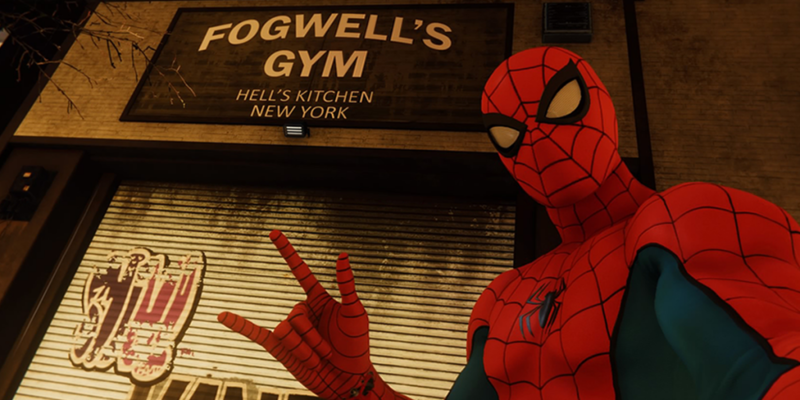 In another reference to Daredevil, and more specifically his origins, another visitable location is Fogwell’s Gym, the training ground for Matt Murdoch’s boxer father, ‘Battling Jack’ Murdoch, who would go on to be killed for refusing to take a dive in the ring. 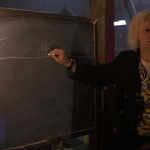 Similarly to Josie’s Bar, Fogwell’s Gym plays a continuous role in Matt’s life, eventually (after being abandoned) becoming his own training ground. 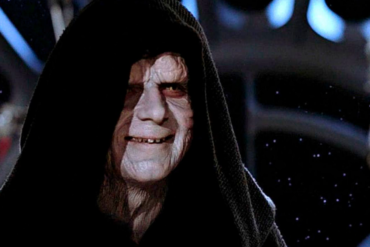 Although Latveria (the home of Doctor Doom) is the main fictional Eastern European country of the Marvel Universe it is by no means the only one. 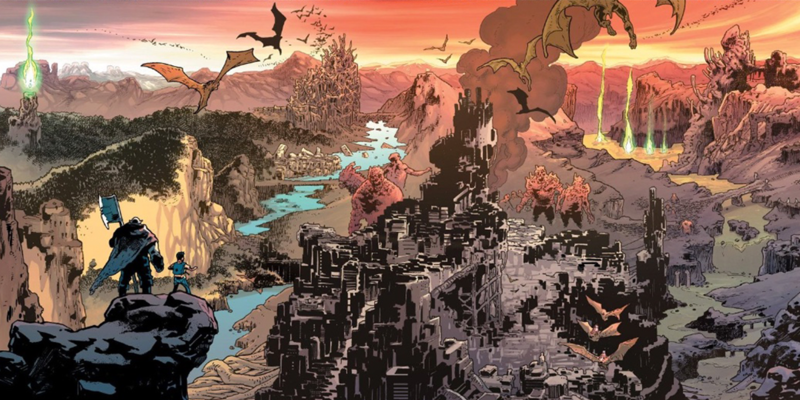 In fact Symkaria, which is on the southern border of Latveria, is another prominent country within Marvel lore, best known as the home country of Silver Sable and her mercenary group the Wild Pack. 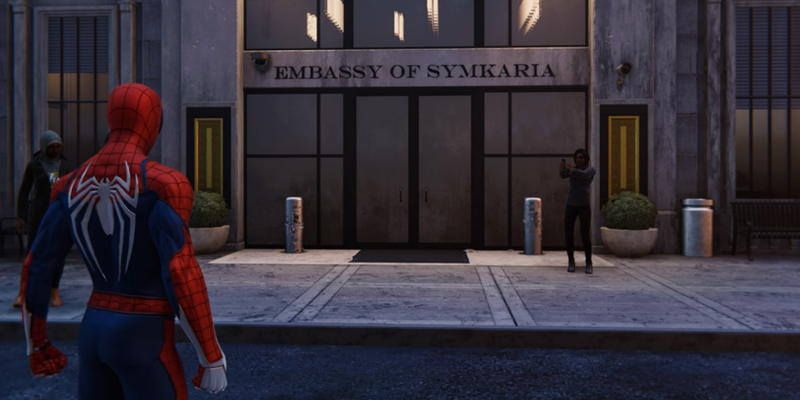 With Silver Sable making a pretty significant appearance throughout Spider-Man’s main story, as a group hired by Mayor Norman Osborn to help protect New York from the Demons, it’s only fitting that the Symkarian Embassy can be found in the middle of the city. With Black Panther and Wakanda’s popularity at an all time high, after his debut in Captain America: Civil War, a record breaking live action movie earlier in 2018, and of course Wakanda acting as the setting for the finale of Avengers: Infinity War, it would of been a big surprise if Insomniac’s game didn’t feature any reference to the hero at all. 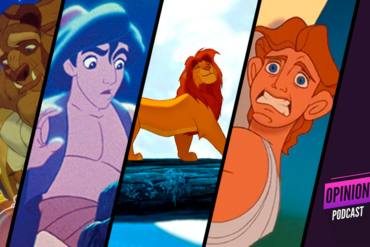 Thankfully it’s a good one, that isn’t too subtle or needlessly over exposed. 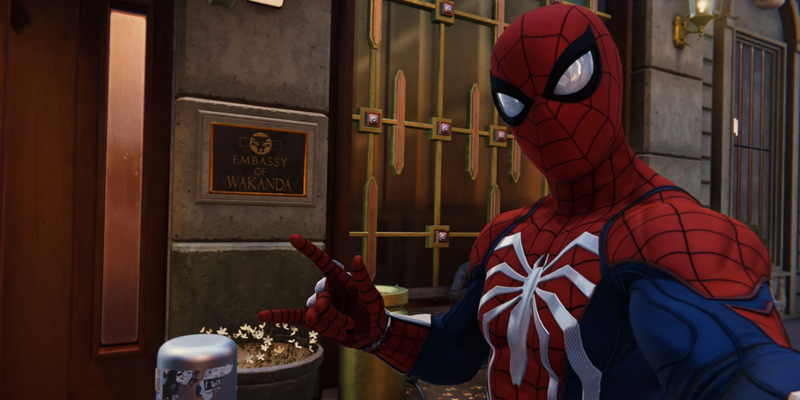 Just a few streets from the Symkarian Embassy, you can find the Wakandan Embassy, which looks a little more elegant and welcoming, acting as another of Peter’s Landmark Photo opportunities. 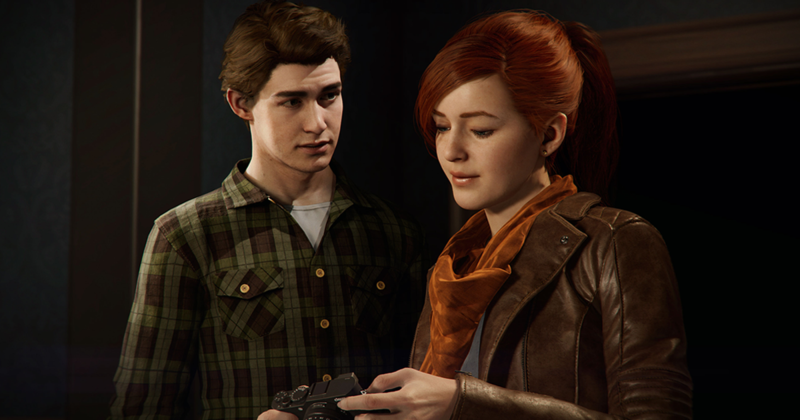 One of the core parts of Spider-Man’s character is his struggle to balance a regular life with his superhero-ing, which has seen Peter lead a dual identity from high-school, through college, and after. 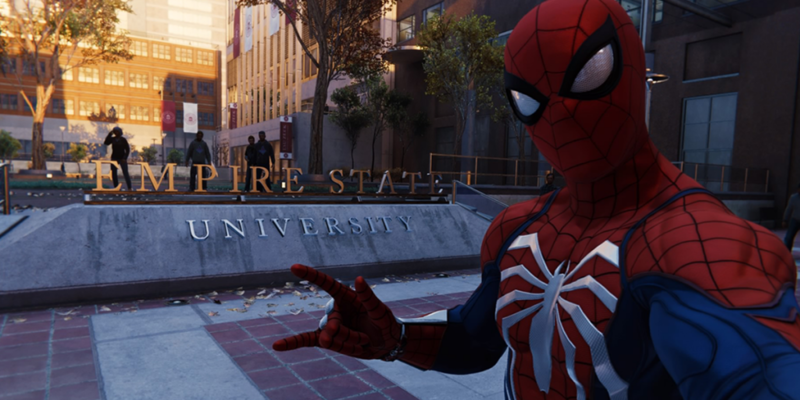 This version of Spider-Man is in his mid twenties and is long finished with school and college, but his Alma Mater, Empire State University (a fictional New York University), makes a number of appearances throughout the game. 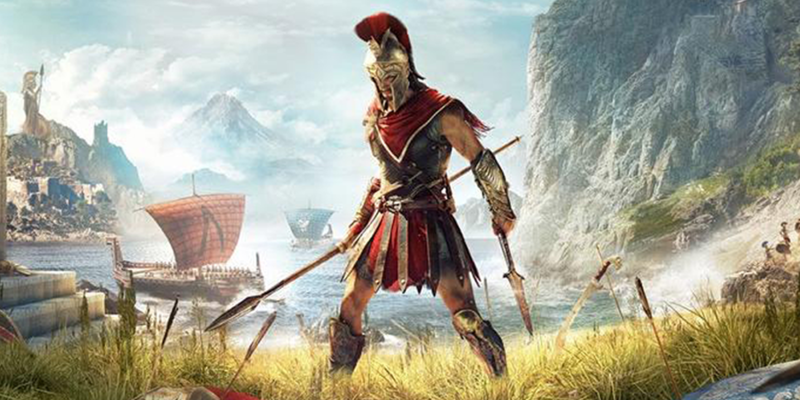 Firstly various parts of the campus are explorable, adorned with flags, signs and banners, and we even see Peter sporting an Empire State University t-shirt a few times. But the biggest reference comes with the side mission ‘College Buddies’ which sees Spidey return to the University and reunite with his comic book college roommate Philip Chang (who seems a few years younger that Peter in this continuity), to help out some other Empire State students who have been infected by the Demons. 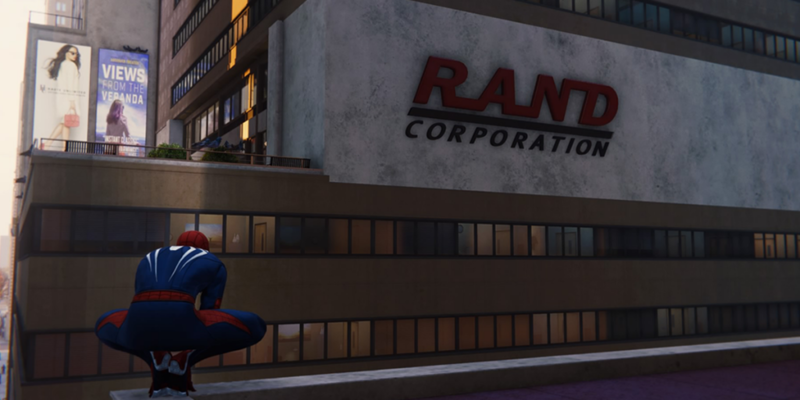 In a world filled with companies owned by rich billionaires who are hiding their secret identity as a masked superhero (or villain), the next on the list is Rand Enterprises, owned by Danny Rand who is better known as Iron Fist. The Rand Tower joins a number of other businesses that flesh out this new adaption of the Marvel Universe into a much more detailed and realised version than we’ve seen before. 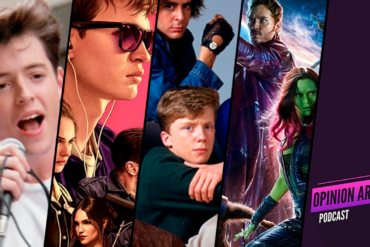 With the MCU in full swing (no Spider-pun intended) more and more Marvel characters are making their way into the mainstream, with Marvel’s Netflix shows bringing in even lesser known heroes and teams into the spotlight. 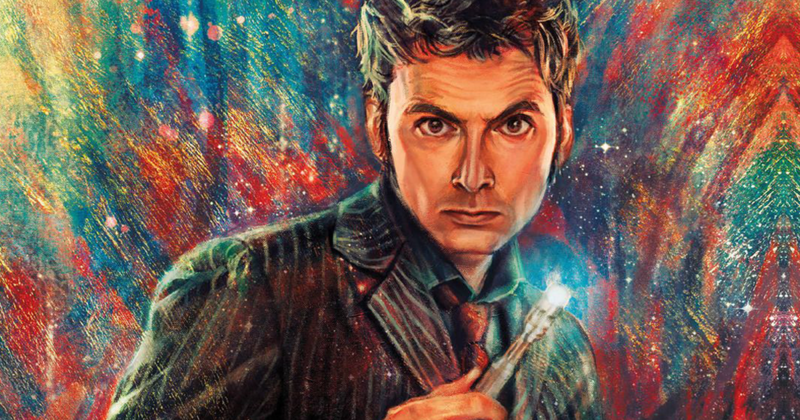 The second collaboration between Marvel and Netflix (after Daredevil) was Jessica Jones, which did a great job of combining the comic book Jessica Jones with the (slightly) more realistic MCU, showing off the darker side of the universe. Jessica’s day job (when she isn’t out reluctantly superhero-ing) see’s her as a Private Investigator, running ‘Alias Investigations’, a location which makes a small and subtle appearance in Marvel’s Spider-Man. As well as Josie’s Bar and Fogwell’s Gym, there are a number of other references to Matt Murdoch and Daredevil, with Peter even finding an old business card that was given to him years ago by ‘a blind guy’ that somehow seemed to know he was Spider-Man. 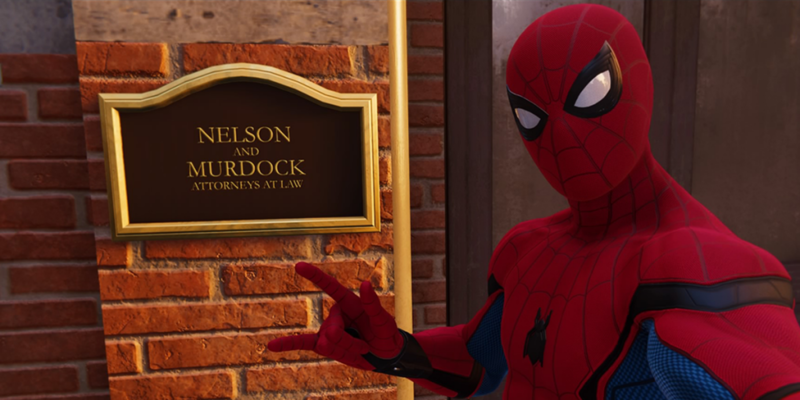 But the biggest reference to Daredevil’s alter ego is actually being able to visit (or at least stand outside) the office building of Nelson and Murdoch, which sits just around the corner from Josie’s Bar, right in the middle of Hells Kitchen. As the answer to what happens after the superheroes come in, stop the bad guy, save the day, and smash everything up, Marvel created ‘Damage Control’, a construction company that basically cleans up the superhero mess. 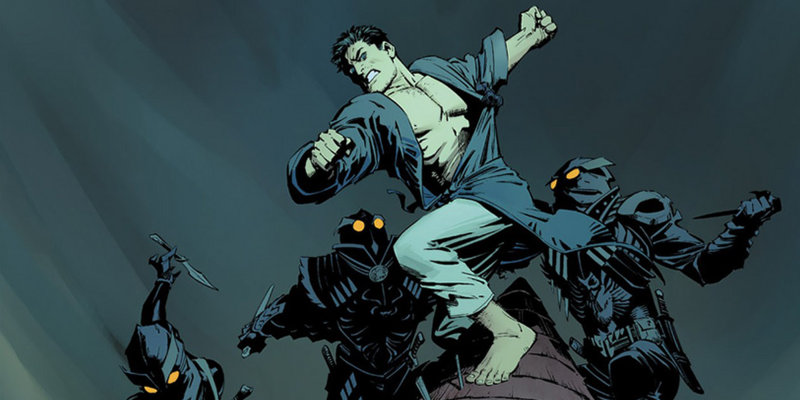 Damage Control have been a solid part of the Marvel Universe ever since their debut in the late 1980s, and even got close to getting their own tv show as a part of the MCU. After that didn’t take off however they showed up as a company created by Tony Stark and the US government in Spider-Man: Homecoming (and sort of act as one of the key motivations in creating the MCU’s Vulture). 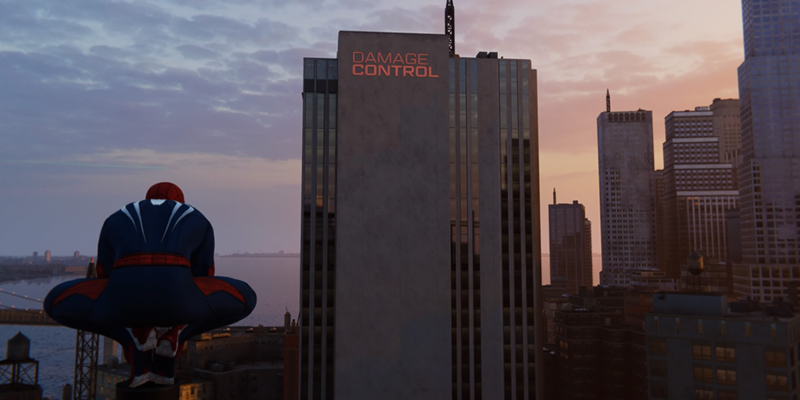 Damage Control’s latest appearance is in Marvel’s Spider-Man where we actually get to see their Head Quarters, as another of New York’s notable skyscrapers. 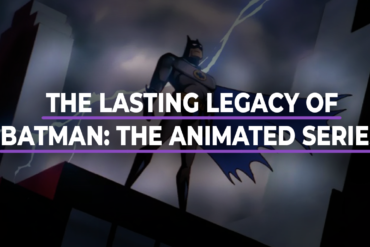 Uncle Ben’s death is one of the most crucial parts of Spider-Man’s origin, and so it’s only fitting that Marvel’s Spider-Man emphasises that point, and Ben’s lasting impact, eight years into Spider-Man’s career. 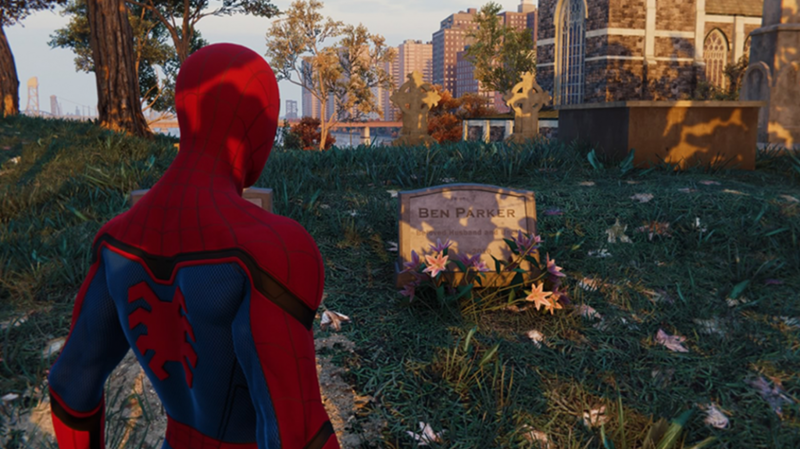 Aside from a few mentions of Ben in conversation with Aunt May, Spider-Man can actually visit Uncle Ben’s grave, which is in a cemetery right at the top of the map (in North west Harlem). With a countless number of good guys catching even more bad guys almost constantly in the Marvel Universe, S.H.I.E.L.D decided that they needed to create a place better equipped to hold super powered villains, and their equipment, eventually building ‘The Big House’, ‘The Vault’, ‘The Cube’, and ‘The Raft’. The most recognisable of which is The Raft, the ‘super-max prison facility’ just outside of New York. 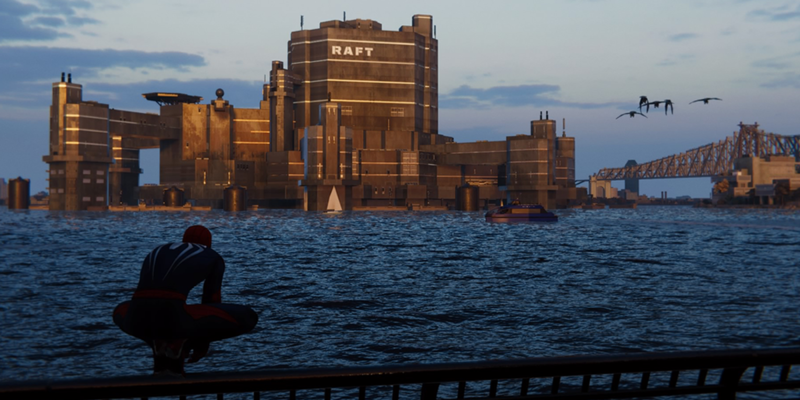 The Raft has been a prominent part of the comic books for years, and even went on to feature in Captain America: Civil War, with it’s latest appearance here in Marvel’s Spider-Man. The first mention of the super max prison comes during the opening sequence, where we hear a number of Spider-Man’s biggest and baddest villains are already locked up. 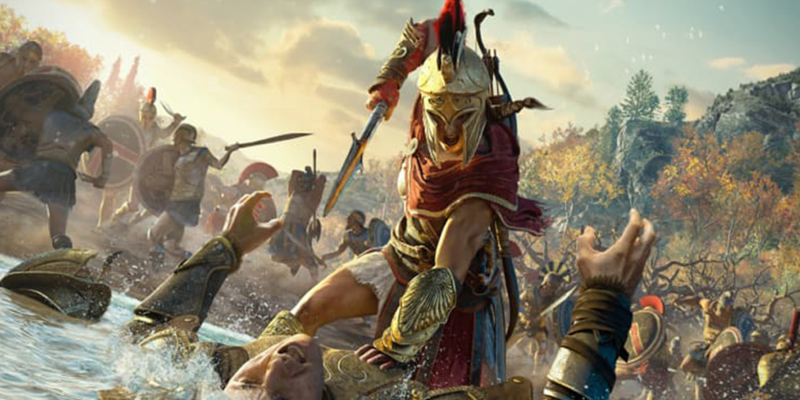 As the game opens up, you can head to the edge of the city and see the Raft (from a distance) in all of it’s super villain holding glory. 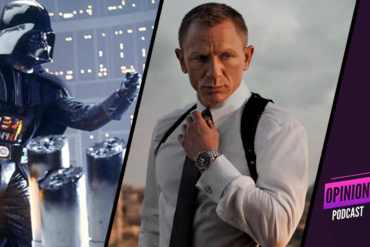 With Benedict Cumberbatch’s performance as Doctor Strange cementing him as a solid part of the MCU, the character is more popular than ever. But overall he still sits just on that border between mainstream and ‘not quite there’. And it’s perhaps this which makes the appearance of Doctor Strange’s Sanctum Sanctorum in Marvel’s Spider-Man that much more exciting (and unexpected). 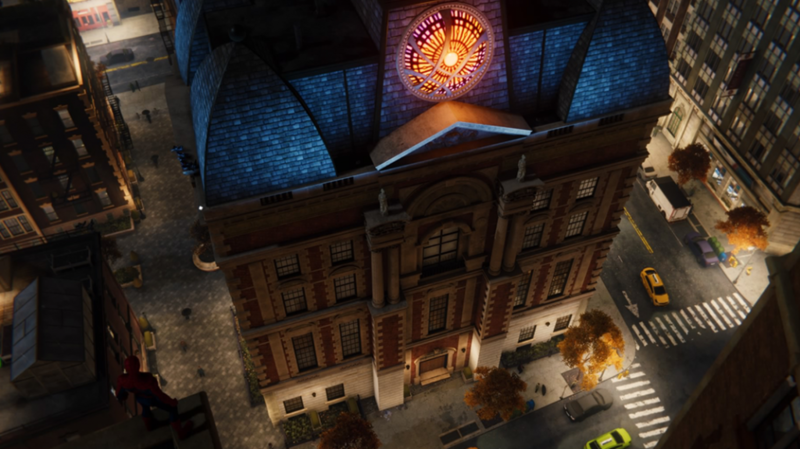 With other buildings and nods to the Marvel Universe (such as the Raft, the Daily Bugle, and Oscorp), almost having to be in the game, it would be easy enough to see some lesser known landmarks like the Sanctum Sanctorum being missed out, thankfully however it’s in there and not only looks great quietly tucked away on Bleecker Street, but really fleshes out this Marvel Universe. 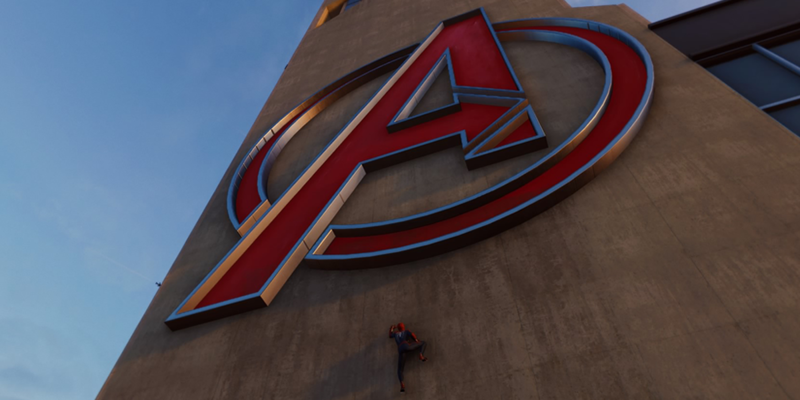 As an iconic landmark of Marvel’s New York City, any game wanting to show off a fully realised Marvel Universe (particularly in a post Infinity War world) has to have it’s own version of the Avengers Tower, and the latest Spider-Man game is no exception. Standing tall as one of the city’s more distinctive towers, when Spider-Man closes in on the tower we can hear Peter’s musings on the Avengers, wondering where they are (and partly explaining why none of them show up during the games events – which see a number of attacks on New York). 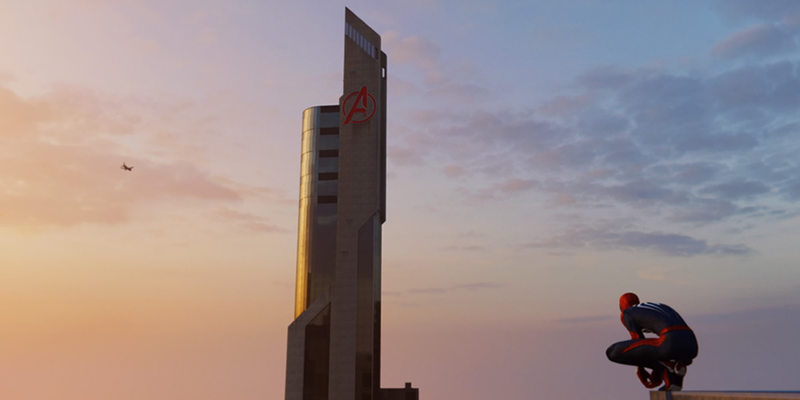 With the tower being the most obvious one, other references to the Avengers in the game vary. With one of the more cryptic hints being a post-it note in Peter’s apartment that says ‘Call T.S About Job Offer’, which in terms of fleshing out this Marvel video game universe has to be a reference to Tony Stark.